You can recognize Kathy by her pleasant disposition and friendliness. Kathy loves coming to work at DSC and has spoken about her experiences at C-U in the Prairibbean in the past. Kathy says that her favorite part of working at DSC is when she gets to work with her supervisor Nadine. One work activity that Kathy excels at is putting together folders to be used at dentist offices. 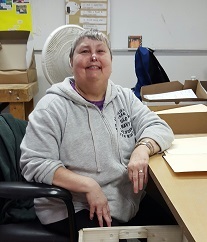 She also helped get a volunteer group from DSC to start volunteering at the Vineyard Food Pantry where she likes helping people get their groceries. Kathy’s favorite thing to do in her free time is to go shopping! She truly has the golden touch when it comes to finding the best deals around and enjoys purchasing t-shirts, sweatshirts, and carry bags. In the past year, Kathy has been apart of shopping road trips with some of her friends and support staff to Springfield, Tuscola, and Decatur. She is very excited for her next shopping trip to Peoria in May! Another activity Kathy enjoys is eating; she loves to sample various food choices at local restaurants for lunch and even attends a cooking class sponsored by the resident chef at Olive Garden with some of her peers from DSC.